At this time in our history, it seems important for children to know that resistance is not just for history, or adults, but is something that even young people can participate in. Therefore, I’m particularly happy to have found this new historical fiction children’s book about the French resistance in WWII. Earlier in the year, I reviewed Number the Stars, about the Danish resistance. 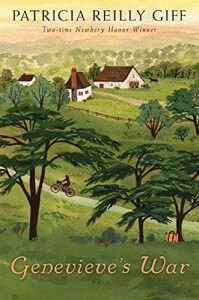 This children’s book is in a similar vein, but set in Alsace, France, and equally compelling and well-written. Is there such a thing as too many children’s books about WWII? No, not as long as there are still people waving a Nazi flag. Is this about politics? No, it is taking a stand for educating children about moral decency, and the importance of courage and conviction. Is this good literature? No, it’s great children’s literature. Historical fiction that puts a child front and center, shows her naive ways, her growth, her pain, and her impressive sacrifices and success, is children’s literature at its best. By the way, I see that Patricia Giff has a large number of historical fiction children’s books. I”ll track those down for review, as I find her a very talented writer, who creates drama in very few words.